While there is widespread acceptance of the idea that in times that demand transformational change innovation has become an important, even critical management capability. And the notion that innovation needs to anticipate both investments in sustaining technologies and investment in new disruptive business models – the ideas first advanced by Professor Clayton Christensen of Harvard Business School in his book, the Innovator’s Dilemma – have received widespread support as well. 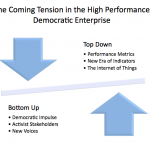 But the approaches that are often suggested for engaging the forces of disruptive change may need to be revised to anticipate the age of social media. The problem is not a surprising one. No one is in favor of disruptive change when it undermines them. Long-time line managers who have developed their careers in a business model favoring one kind of profile are naturally likely to resist investing in a new business model that will put them at a disadvantage and possibly even bring in leadership from a new generation or new group with a different skill set. S it’s not surprising that an old-line institution such as the Postal Service might have managers who would resist a new era of digital media. But what might be even more surprising is the subtleties within the disciplines inside the institution – those who have made their careers improving the delivery of letter mail, resisting new patterns that would emphasize parcel delivery and integration of the traditionally independent institution with new e-commerce providers. But if the customers are going to act as Christianson suggests that they will in his exposition of the shift too disruptive technologies, then there’s a need to refine strategies for him bracing the disruptive future. Christianson suggests three models in an article written in Harvard business review quote “on innovation”, a Harvard business review paperback copyright 2001, “meeting the challenge of disruptive change”, Clayton M Christiansen and Michael Overdorf first there’s the skunk works that develops the new technologies in a laboratory set apart from the traditional enterprise. Second there’s the division within the company that said apart from others and finally there’s the strategy of acquiring the technology that allows for disruptive change. Each of these three strategies might be seen as a “sequestering strategy” where the new investments are protected from interference from the traditional line managers. The problem with relying on sequestering strategies alone is that organizations are increasingly transparent and services require integration. Both features of the network economy are likely to make it almost impossible to protect the alternative vision of the future from the traditional enterprise. This is good news for entrepreneurs but it is going to be challenging for large complex organizations. How do you invest in alternative visions of the future without being stopped? One pathway that’ worth a new look may be to revisit the notion of open innovation. Clayton Christianson writes about open innovation in his blog (Wednesday, September 19, 2012) he relates his experience at the annual meeting of the Academy of management (AoM). He describes a session on open innovation featuring Allan Afuah from Carnegie Mellon, Karim Lakhani and Michel Tushman from HBS, and Todd Zenger from Washington University in St. Louis. “Open innovation is a method of innovation that has arisen in recent years which allows companies to essentially source some of their innovation efforts to outside parties, often through contests where individuals compete to develop the best solution to the innovation challenge the company has set forth,” Christensen writes. Opening the innovation process but at the same time given the challenge and the intended solution precise definition offers an important potential path around difficulties that will become increasingly apparent in the future enterprise. If the moral of the story here were to “adapt to new technology” it would still be a worthy discussion. But there would be little news. Organizations throughout the economy have had to adapt to survive and many haven’t been successful. The Internet and the technologies that are associated with it have undermined the fundamental business models of many of the icons of the American economy. The impact of new technologies is a story that has been told many times. But in fact, there is an even more important and interesting story that is unfolding in every sector of the economy. The implication of the new communications modes that have made global communication instant, ubiquitous and free have had brought implications for the way in which companies communicate with one another and within themselves. The classic model of communications for the firm is one that emphasizes the employees and management. Many of the key conversations that take place are therefore thought to take place within the box outlined above. 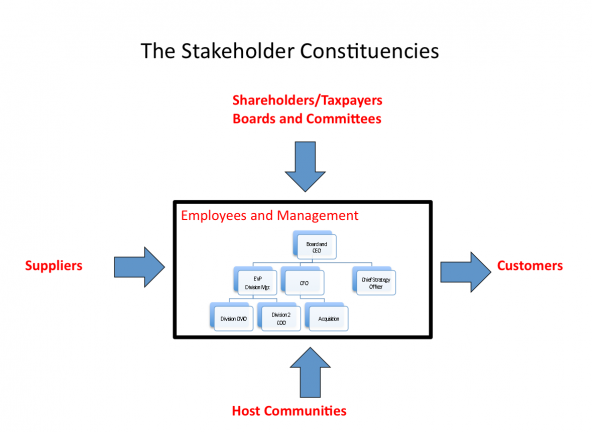 Even before there was Internet communication facilitating global connections, the boundaries of organizations were becoming less important and connections between the traditional organization and its customers, its shareholders (in the case of public at organizations this is taxpayers, and their representatives), suppliers and even host communities describe the multiple dimensions that describe the stakeholders in a representative manner. The pressures that they supply are easiest to see and understand. What has become important in the modern era has been that the economics of communications have made it so dramatically easier that there are new voices seeking to express their views and to defend their interests. Even more importantly, there is growing recognition that the stakes really do matter. Transparent enterprise and the abundant self-publishing sources of analysis have made it easier to see strategic issues as they appear on the horizon of the leadership. The types of products, the location of tomorrows jobs, all of these issues and more are being contested in the new, increasingly competitive market. Andrew S. Grove, the former leader of Intel, wrote a book in the mid-nineties in which he sought to help leaders “exploit the crisis points that challenge every company.” In 1996 when the book (Only the Paranoid Survive) was published, not even the head of Intel might’ve guessed the true scope of the revolution that was underway. In the short term, virtually every institution, both public and private, was forced to contend with the impact the creation of a global Communications system that was immediate, global, ubiquitous and virtually free. Harvard held two conferences, one in 1998 and one and 2000, and sought to involve the entire university in thinking about the Internet and Society. There was wide recognition at the time that the Internet would have a dramatic impact on concerns that range from business to learning to global diplomacy. The question was asked “Was this a revolution that was more like Gutenberg or Luther? the invention of the printing press or the Reformation?” This may sound like Harvard. But the point should not be lost that there has been a recognition for some time that a revolution was taking place and that it would have wide implications for the economy, security, knowledge and much much more. But whether the Internet would be a call to action for a given organization or not, it was the perfect illustration of the challenge for leadership in seeking to deal with pending change. 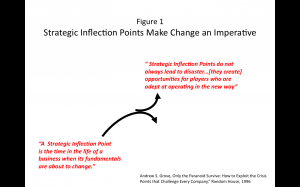 How was one to know that a downturn was actually a lead up to a strategic inflection point? 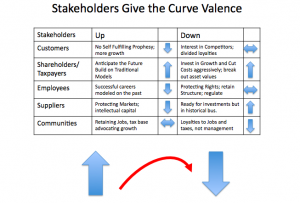 Grove defined strategic inflection points as the place where a business or public institution recognizes that the fundamentals of the traditional business model were about to change. He described his own practice of looking for “10 next change” among the critical variables. And he emphasized that change did not have to signal pending disaster. For those who can become adept at anticipating strategic inflection and operating in a new way, these moments of transformational change can offer opportunities.